Victoria is a responsive restaurant HTML template created by System32, and featured on ThemeForest. It is very feature rich and great looking, and a very powerful HTML5 template with a bunch of great features, easy to edit for professionals and for users with no programming experience. 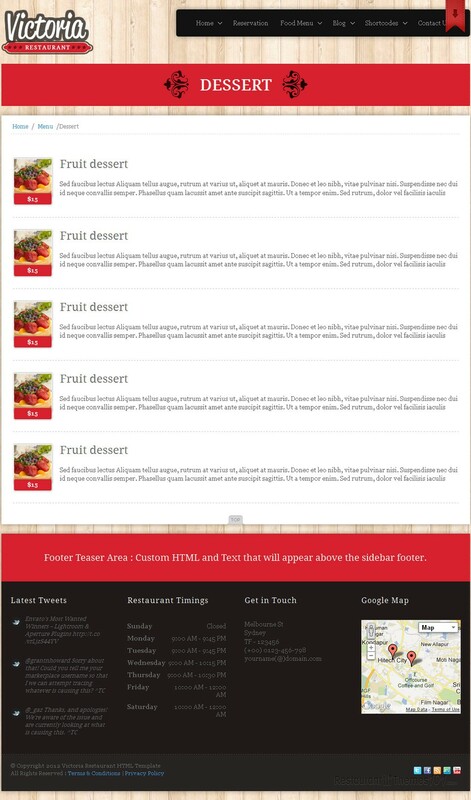 You will be able to change any element color, including backgrounds, texts, links, menu links, typography etc. The main content block of the template is always placed before the sidebar regardless of the sidebar position you choose, so it is instantly crawled by search engines, therefore it is SEO optimized in a great way. The layout looks very nice and elegant with a big responsive Flex Slider on the homepage that will instantly grab your visitor’s attention, especially if you put nice photos of delicious food in it. The theme is lightbox integrated and it contains 100+ icons with many color variations. Right and left sidebar are included, and overall the Victoria template has enough space for your content, so you can fill it up with your posts and photos of your dishes and make it completely yours and personal. It also contains fancy boxes which you can display on your homepage. Add thumbnail photos of your featured dishes along with some teaser text and have your visitors automatically redirected to a full content page by just clicking the thumbnails. Here, you can present the dish thoroughly along with photos and even a full recipe if you want to. 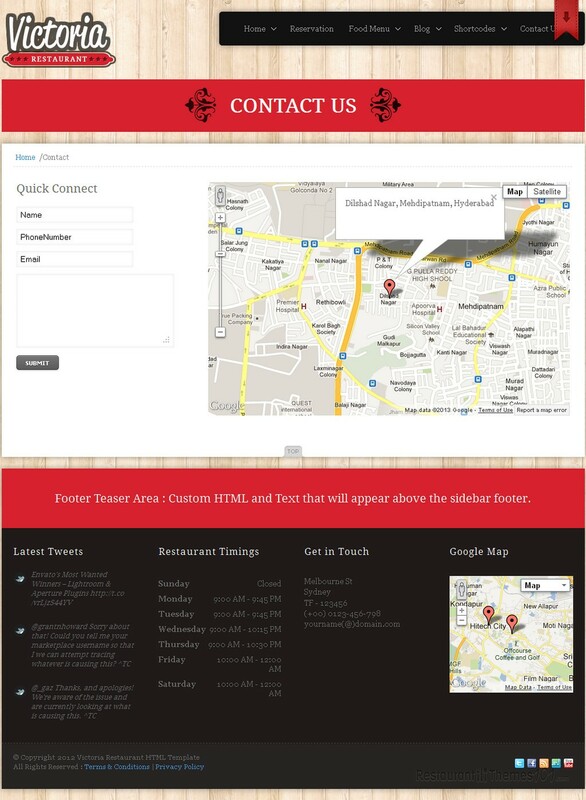 The theme features Google Maps, and you can place a small map on your homepage with exact directions to your restaurant. You can also connect your website with Twitter and have your latest tweets appear on your homepage and you will be able to integrate with all the most popular social networks: Facebook, Twitter, StumbleUpon, RSS and YouTube. 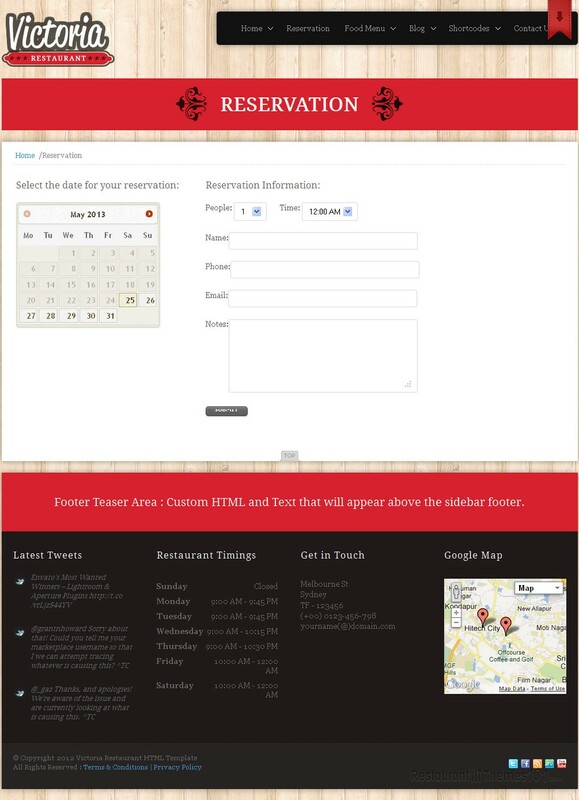 This responsive HTML restaurant theme comes with HTML folder containing pages, documentation folder and PSD source files. 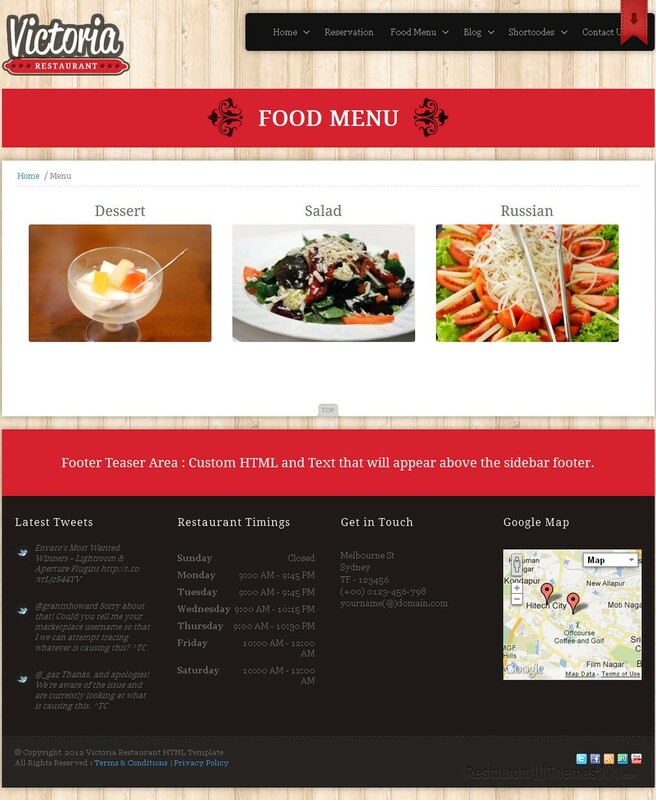 Besides this HTML template you can buy Victoria also as a WordPress restaurant theme.